The hourglass of time has been stolen by the infamous cat burglar La Forge! The hourglass of time has been stolen by the infamous cat burglar La Forge! Solve pictographic puzzles as you travel across the globe and through time itself. Journey through critical points in history from the Napoleonic wars, the birth of the United States, and many more. Solve over 100 puzzles in Story Mode, then tackle another 150 Bonus Puzzles. Looking for more challenge? See if you can 3 Star every puzzle by completing each puzzle without making a mistake or using a hint. 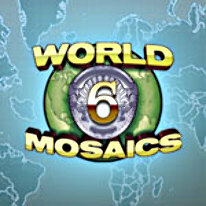 It's up to you solve the puzzles and stop La Forge in World Mosaics 6! -Over 20 hours of gameplay!